On June 28, 2010, Det. Bryan Casey along with members of the Galloway Twp. 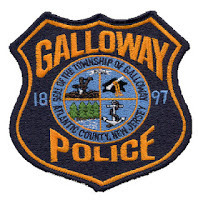 Police Department and The Atlantic County Swat Team effected a search warrant on the 400 block of Orange Tree Avenue in the Pinehurst section of Galloway Township. Arrested subsequent to the warrant service was, John F. Brown II, age 30, of same address. Brown was charged with Unlawful Possession of 3 firearms to include 1 handgun previously reported stolen out of Ventnor City and 2 rifles. Further, he was charged with Possession of 233 grams of Marijuana and Distribution of Marijuana and prescription narcotics. Brown was also charged with possessing a firearm while committing a narcotics offense. Brown was lodged in the Atlantic County Jail Facility in default of $100,000.00 full bail. This arrest was the result of a two (2) month investigation.